Less than four hours before NaNoWriMo 2011 begins, and I am sticking with my crazy story about Action Man and Dialogue Dog, a superhero duo who appear whenever a writer is in distress. I’ve had lots of different ideas about what story to tell. I’ve decided to focus on the writer who creates these guys (and lots of other characters, good and bad) as she struggles with her novel, rather than on the super characters themselves. I could write a Becoming-Action-Man story full of angst and sacrifice, but that seems a little heavy for a guy who has a talking Schnauzer for a side kick. Besides, it would be breaking a cardinal rule for my NaNoWriMo projects: keep it silly. Keep it silly doesn’t mean write about funny or ludicrous things, although it has included that these last few years. It’s a tag for a broader concept that helps me to hit my word count every year. Keep it silly reminds me to lower my expectations of my writing. You would think that trying to write an entire book in thirty days would be screwy enough to keep me from having visions of grandeur for my NaNo novel, but it’s not. It’s way too easy to start thinking “I should publish this” which leads to “It needs to be really good. My writing must be excellent or else”, which is dangerous territory. Once I start thinking about the quality of the writing, I slow way down and might even stop completely. So I keep it silly to help myself stop worrying about writing deathless prose. Since I can’t possibly write a Pulitzer prize winner about a librarian who is basically a superhero mime, I don’t have to sweat over every word. I can just let it rip, and that’s key to getting to achieving my word count goal. In his book No Plot? No Problem!, NaNoWriMo founder Chris Baty talks about a related concept, literature-as-bran-flakes, where we think that for a book to be good, it must be full of things we find dry and tasteless. To counteract this problem, he makes two lists, one of things he loves in novels, and one of things he hates. He says it’s a definite sign that he is trying to get some substance into his novel if he starts putting the things he hates in his book, but that the minute that he does, the writing gets harder, because he doesn’t like any of those supposedly worthy things. 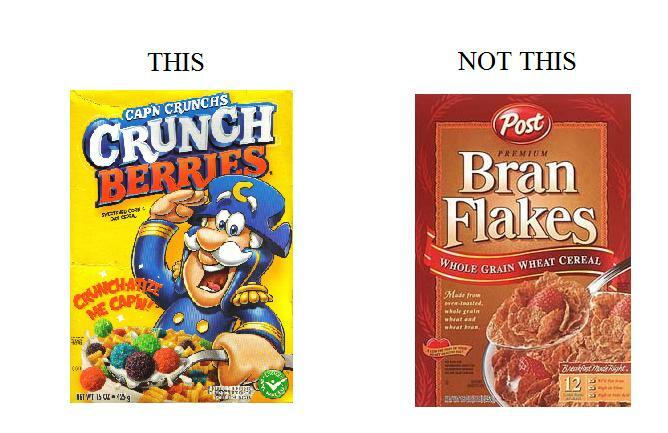 My shorthand for this is: Skip the bran flakes and eat the Cap’n Crunch with Crunch Berries. Cram the stuff you love with guilty pleasure into your novel every chance you get and not only will you not take it too seriously, but you will have loads of fun at the same time. This is why NaNoWriMo is so much fun, and also how I have managed to get to 50,000 words five years running. Simply by keeping it silly. Chris Baty, Kit Dunsmore writer, NaNoWriMo, National Novel Writing Month, No Plot? No Problem! Love your philosophy of keeping it silly – I believe wholeheartedly in that magic myself. Your idea for the novel is a delight! I would love to read that book. Did you finish it? I finished the rough draft during last November and it was actually a complete story, although the ending was a little abrupt. It wound up being about lots of other things I didn’t expect — writing classes and a world where people treated art like professional sports. I’ve had one friend read it and I don’t think she was overly impressed. My sister is in the middle of it and she loves the humor in it, but then I wrote it with her in mind. It does sound fun! I like the sound of those added touches that crept in. I’m glad your sister loves the humor in it. If you ever feel like sharing it with another reader, send me a PDF via email.